WELCOME TO THE CPF WEBSITE! Northcliff Ext 2, Waterval Estate. To Integrated Technologies (Tel: 086 1100 409) for the complimentary hosting of the CPF Website. 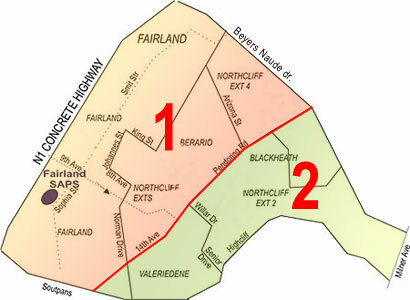 To Sign-A-Rama Fourways (Tel: 705-2272) for the new sign at the Fairlands SAPS. To ADT, Chubb and Coin Armed Reaction for supplying the paint and arranging painters to paint the Community Service Centre and the Operations Offices. Thank you to the members of the community who have debit orders on their bank accounts and contribute monthly to the CPF. The website hosting and Internet access is kindly sponsored by Integrated Technologies(Pty)Ltd.